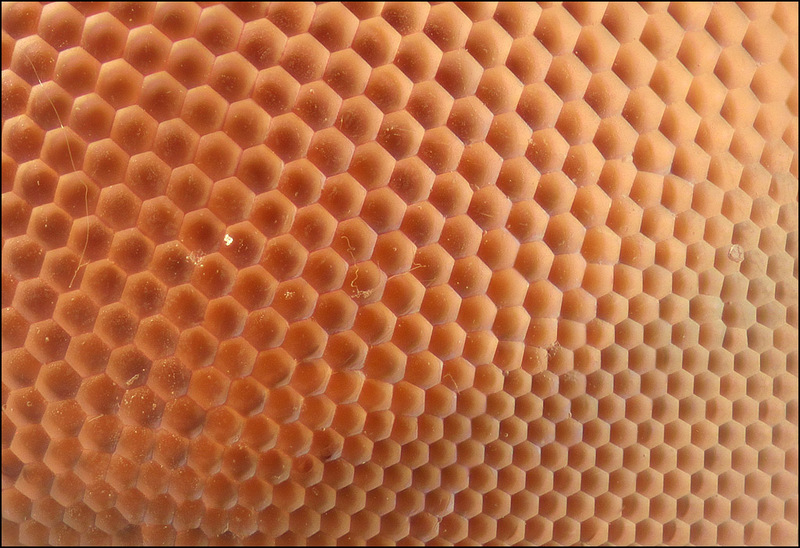 Here's an interesting bit of dragonfly eye, and the story of how it was shot. 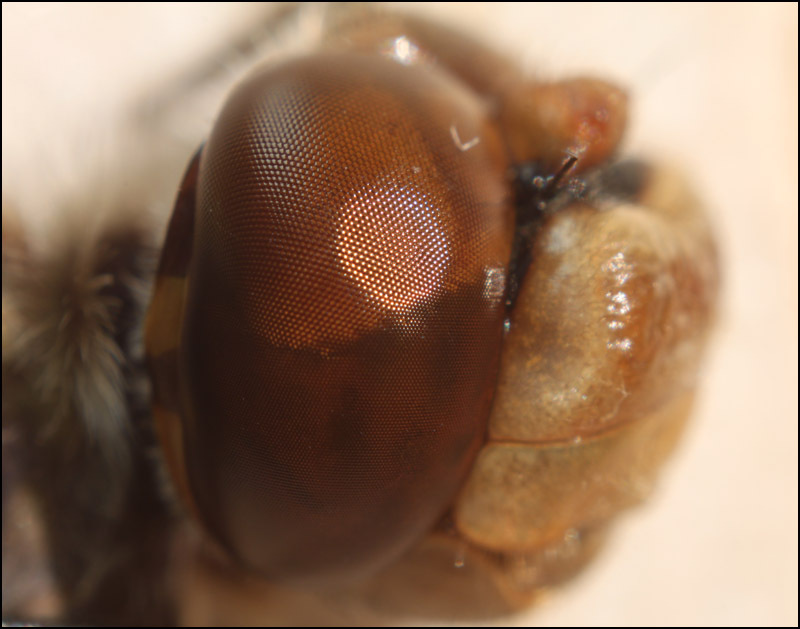 Dragonfly eyes tend to be divided into two halves, the lower part populated with small ommatidia and the upper part with large ommatidia. Robber flies have a similar division, except that theirs is more front versus back. In both cases the different regions presumably represent a division of labor, for example between high resolution used for hunting and lower resolution used for navigation and threat avoidance. In the image seen above, we're looking at an area about 1 mm wide in the center of the whole eye as seen below. The detail above was shot with very diffuse illumination; the overview below was shot with no added diffusion at all, just a fluorescent ceiling fixture and the bare end of a fiber bundle about 1 foot from the subject. You can see the roughly hexagonal reflection caused by the light source being directly reflected off ommatidia only in a roughly hexagonal region. It's not as crisply defined here as we'd see with sunlight, but probably you get the idea. It's worth noting that the detail image above has been carefully stacked and retouched to show only the surface structure of the eye. 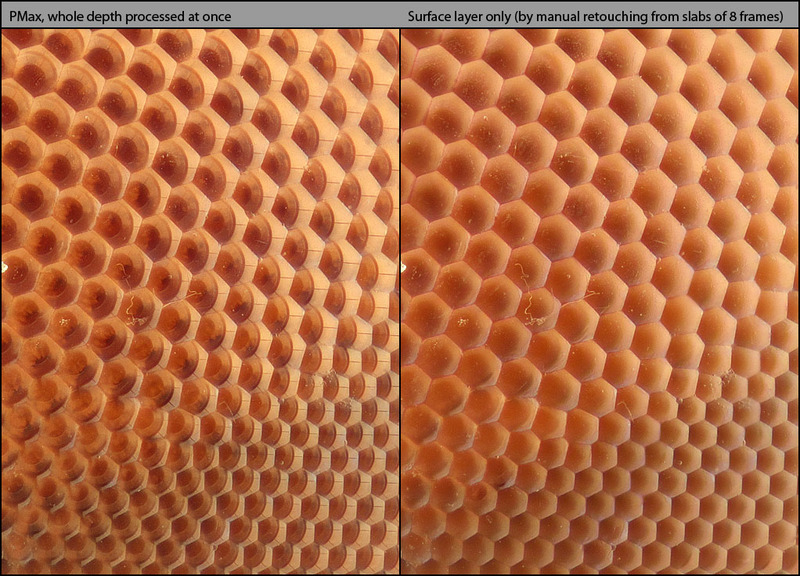 Here's a comparison showing what happens if I just turn the stacking software loose to do the best it can. Correct, the full stack gives a mess! The reason is that in the grand scheme of things the ommatidia are quite shiny, so they make nice crisp reflections of the environment around them. 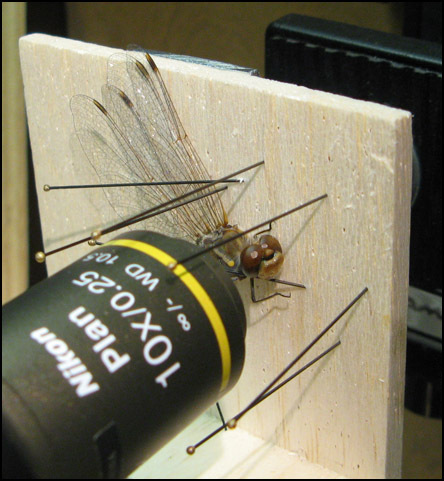 In this case, that environment consists of a microscope objective, an array of insect pins forming a sort of "fence" around the specimen, and some Kleenex tissue wrapped around the pins to form a diffuser. The details of that arrangement are quite faithfully reflected in each facet, and since those details are high contrast, that's what the software latches onto. Fortunately, reflections from a convex mirror appear to come from a depth somewhat behind the mirror itself. This difference in depth allows the surface and the reflection to be teased apart during stacking, as long as the lens DOF is shallow enough. The basic technique was outlined in the thread by seta666, HERE. For this stack, there were about four frames separation between focusing on the surface of an ommaditium and focusing on the reflection of its environment. So I processed the stack in slabs of 8 frames, starting every 4th frame, and put the results together with retouching. The retouching process nominally used a PMax master, but by the time I was done, every pixel position had gotten filled in with content from one or another of the thin slabs. It would be great to automate this process, but I had enough trouble making some of the decisions by eye that I am not optimistic about doing it with software alone. Just to finish touching the bases, here is the setup for shooting, minus the Kleenex tissue. The stack was shot with a Nikon CFI 10X NA 0.25 objective on Canon 55-200 mm zoom lens, exposure time 1.6 seconds per frame using Live View and electronic first shutter curtain, dual fiber halogen illuminator. 93 frames at focus step 7.9 microns, automated using a StackShot rail set at 16 of its "steps" per frame. Processed in Zerene Stacker, of course. The image at top of thread is cropped to about 53% of full frame width. The dragonfly is a preserved specimen. I stole it from a spider several weeks ago and have been keeping it from drying out by storing it in an airtight container with a paper towel wetted with isopropyl alcohol. That process has worked out surprisingly well -- no trouble with mold, and while the eyes have certainly changed appearance, they have not dried out enough to lose their structure. Your specimen looks like Sympetrum corruptum. Some very large emergences of this species were reported in Oregon and Washington over the last 2 months and some amazingly dense directed flights (migrations) were reported along the coast (mostly in Oregon). I have been wanting to try to capture a stack that shows the optical qualities of a living dragonfly eye and also surface details. My first attempts have not been successful. It may be impossible in one image. Ron and Steve, thanks for the feedback and further information. Javier, the timestamps on my images indicate only about 1 hour between getting the first image of the full stack and having a retouched image showing just the surface. That included both running the slabs and doing the retouching. In this dragonfly, the facets are flat enough that the reflections are focused entirely behind each facet. As a result each slab consists essentially of four portions: a central disk that is completely OOF, a ring of focused reflections that I do not want, a ring of focused surface that I do want, and a background that is again completely OOF. As a result, the retouching process for this subject required only that I stroke over the outer ring of focused surface, being careful to avoid the inner ring of focused reflections. I think in your case maybe each facet is curved enough that some of its reflections lie at the same depth as some of its surface. That case would be much more difficult, requiring to handle each facet individually. Clean images like this are naturally produced by SEM (scanning electron microscopy), since in SEM there are no reflections of the environment. With an SEM you can even get a reflection-free image of a fruit fly's eye, despite the setae sticking up between facets. I remember I spent much more time than 1 hour, the dragonfly eye maybe is flatter and because of its big size not much magnification is needed.